Really cheated on these Christmas cards! The Graphic 45 Christmas Emporium Papers were so beautiful I didn’t alter them in any way, just added the interest by doing lots of layering with an assortment of Stampin Up cardstock.To finish I added ribbon bows and glitter.Quick post tonight as its shopping night, then home to pack my craft bag for a class tomorrow – I am looking forward to it, til tomorrow…. To finish off my Graphic 45 Christmas Emporium series I have put up the last four cards so that tomorrow we can look at something non – christmassy! 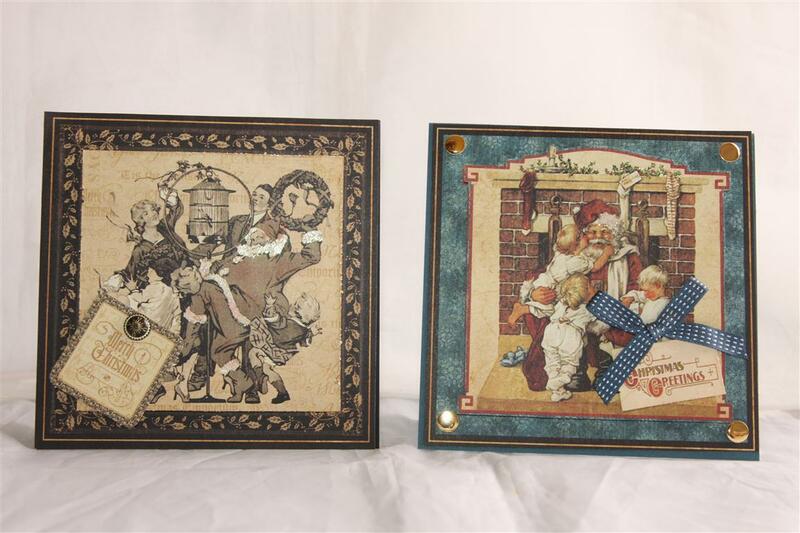 These cards are so simple – just lots of images from the papers , a bit of fussy cutting and layering, and added interest with the ribbon, craftworks candi,lace , rhinestones and kindglitz. I have been quite busy in the carft room over the last couple of days, and will have to get nathan busy with the camera tomorrow.I am on holidays for a couple of weeks, and I really want to finish off some paper collections to make room fro the gorgeous Kaisercraft that is coming out over the next couple of months ( I was lucky and had a sneak peek! )Til tomorrow…. Graphic 45 Christmas Emporium patterned paper – the card on the right is self explanitory,the image takes up the whole of my card front, so didn’t need much else. 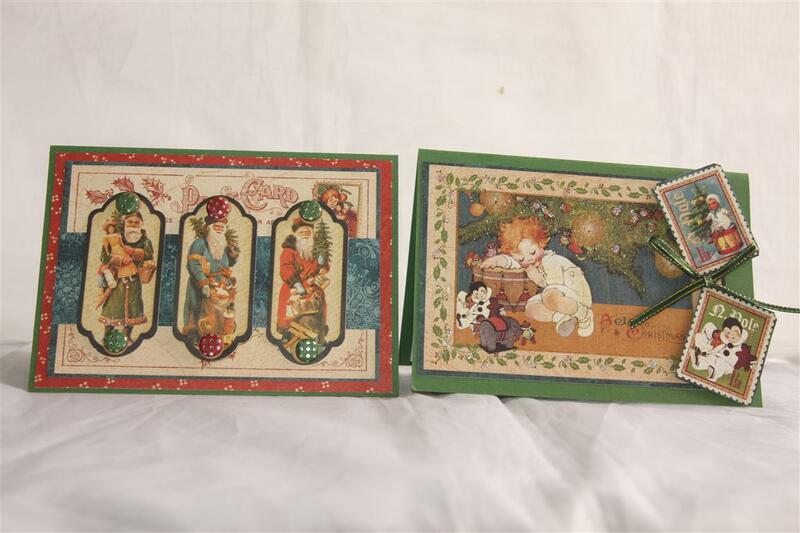 The card on left, is another story… I used an EK Success punch,some ribbon and trim and craftworks candi. The Die Cut in the centre is a neat little stampin Up die which opens to reveal another image inside. I don’t actually have this die set, we got to play with it at the stampin up convention Kay kindly invited me along to in May, but it is on my wish list!I have been creating up a storm today in the craft room, and I am going back there after this to continue a few projects I have left to dry.. Til tomorrow…. 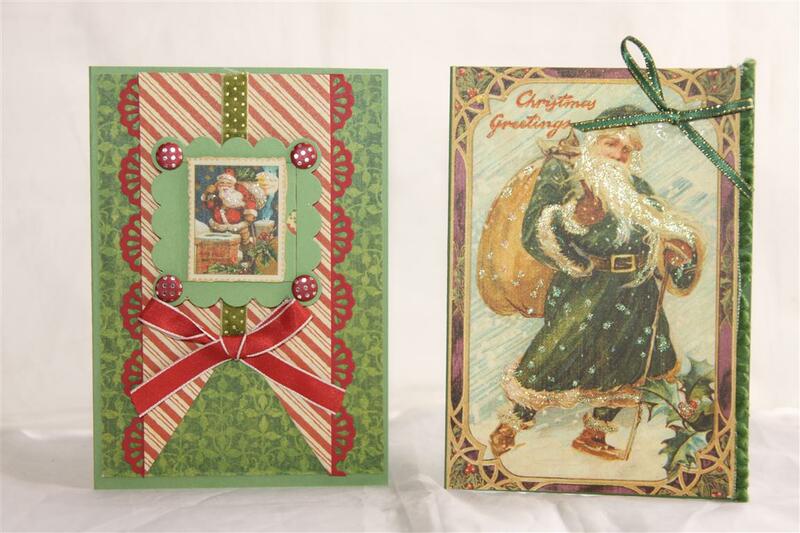 These two cards were so easy, the images were all there on the Graphic 45 Christmas Emporium papers, just a matter of some matting for interest, and ribbon for texture – done! Til tomorrow…. 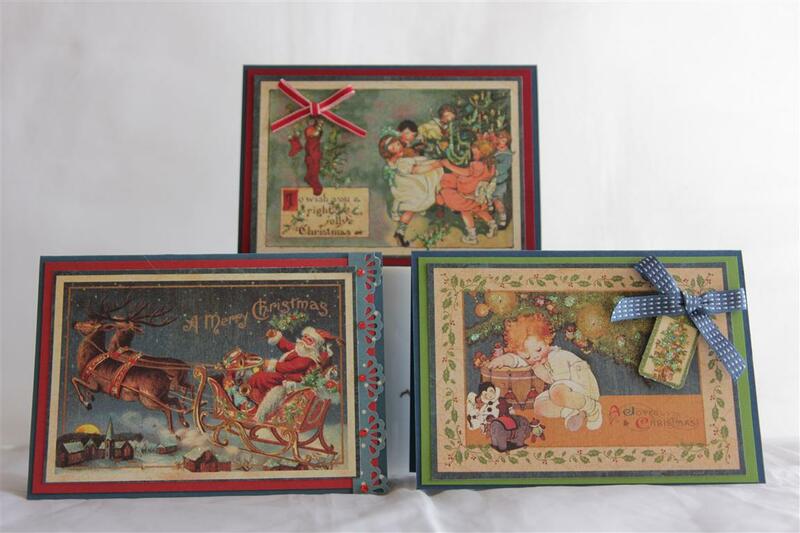 Although I have titled these cards Graphic 45 Christmas Emporium, I think a little bit of graphic 45 Christmas Past from the previous year has crept into these ones – just goes to show – never throw away those scraps! also explains why I cant move in my craft room at the moment. The time is coming for a ruthless clean up. These cards are self explanitory, a bit of fussy cutting of the images, some layering and bakers twine and ribbon added for texture and interest.I also see I used an ek success border punch on the card on the right. Til tomorrow…. 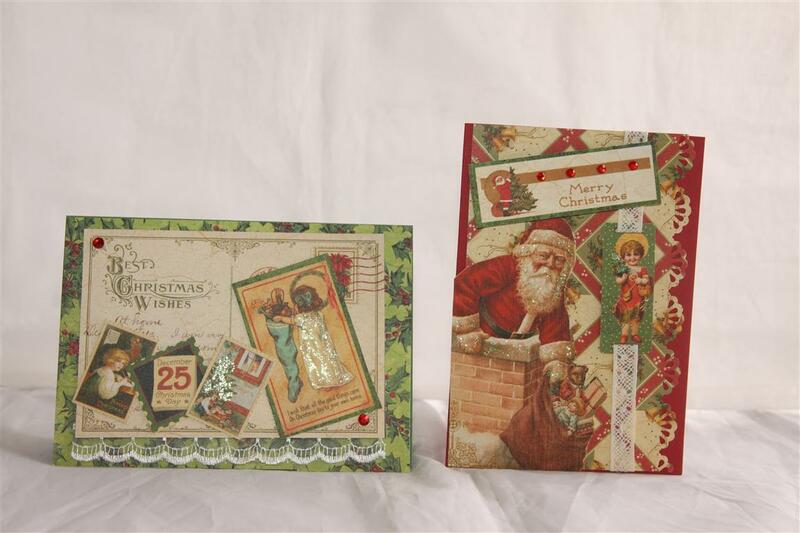 We are back to some christmas cards, and i have used Graphic 45 Christmas Emporium paper collection, which is last years release, but I had a big pad tucked wasy which I didn’t use last year, and i was very excited to stumble upon it,as graphic 45 is one of my favourite paper companys! I made these two cards as 6×6 cards, I don’t often do that size, but the images are large and I didn’t want to cut into them. 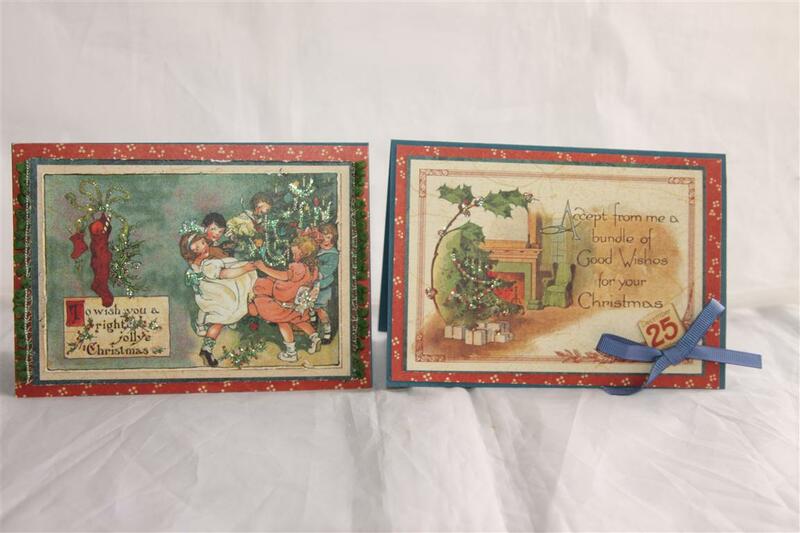 For the card on the left, I did a little layering, inking and distressing and added a tag with a stampin up vintage brad. 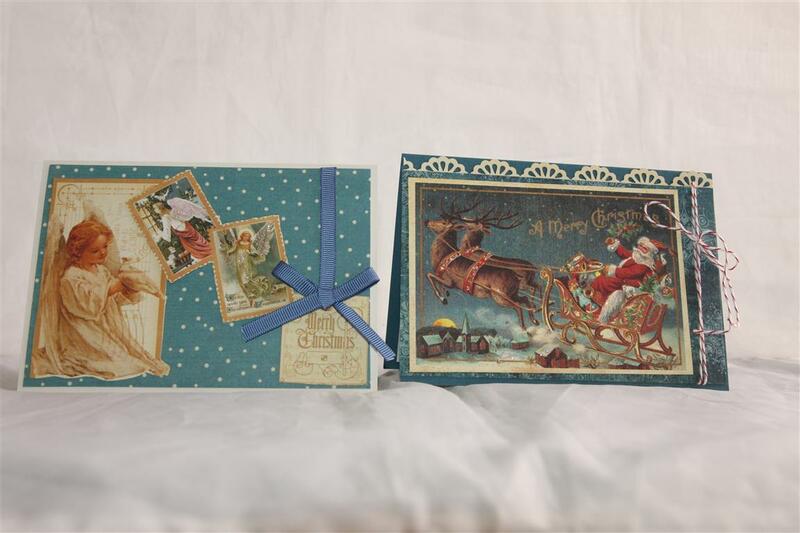 For the card on the right I also layered, ( no distressing) ans added gold craftworks candi, and a stampin up midnight muse ribbon bow. Had agreat class today with my monday ladies, and also bought a few new male themed stamps to play with – one month soon the ladies are going to do male cards!Til tomorrow….